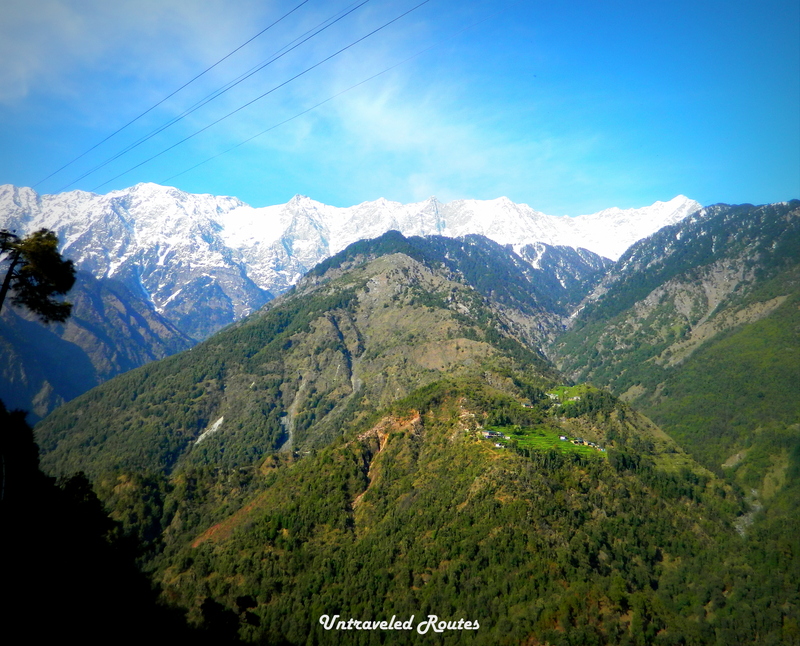 This Road Trip was part of our 3-days tour covering Mcleodganj-Dalhousie-Dainkund Peak in Himachal Pradesh. Time was certainly of essence as we had 4 days including travel from Delhi to the destination. We boarded HPTDC Volvo from Delhi to Dharamshala, then took a cab till Mcleodganj (the distance is ~9kms) and continued our journey on bike from there. We experienced incredible moments of wonder, adrenaline rush, excitement and peace; and experiences shall always be shared!!! Fitness is Critical: ‘Healthy body and healthy mind are keys to blissful life’. We follow a fitness regimen to the maximum extent possible & have tried to inculcate a routine in our lifestyle; we go for regular swim in summers and pursue gym in winters. Being fit has really helped us during traveling, we have been able to explore & test our limits on most of our trips – be it Srinagar, Rajasthan or Himachal etc. It gives you so much of confidence and mental strength. 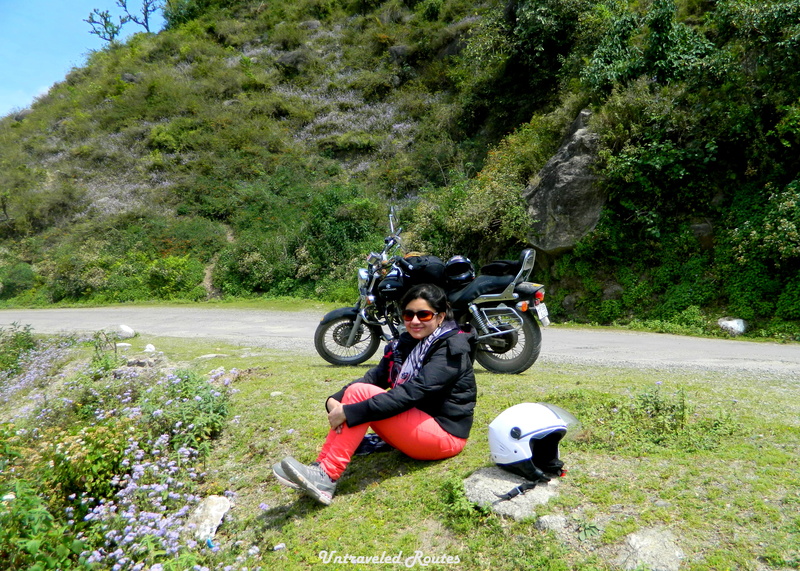 Plan & Prepare: The route we covered on this trip by bike was ~125 Kms from Mcleodganj to Dalhousie. If you guys have been to hills you can imagine the road which moves in a circular motion as you go higher, the structure of the road does not allow you to cross a certain speed, you still have maintain a consistent speed considering the duration of your travel. Infact the road till Shahpur was pretty straight past that it started becoming jittery. Fortunately, the whole road is maintained well barring few patches which makes very difficult for a bike as it skids. There’s something about bike ride: You will find innumerable bike rental options at Dharamsala and Mcleodganj as well. These guys keep variety of bikes available at different costs ranging from INR 600 – 1000. Since we were a couple we selected sturdy and comfortable (front as well as back seat along with support) Avenger. It’s important that you select a bike having broader seating pattern as longer travel hours on bike can have impact on your back and overall health. The bike you choose would be totally depending on your discretion. Traveling by bike gets you so close to nature, it refreshing and thrilling at the same time. Keep it Light: Make sure you have all the necessities – clothing, footwear, food and medicines. We had just one backpack and one small hand bag for food supplies. This made things manageable. As we had to carry our stuff on bike from one destination to other, lighter the better. And since this was a Himachal trip we had to carry woolens and jackets but packed it all in one single decent sized backpack. Must haves in your food bag: When we travel to higher altitude areas our snacks bag always comes along. The items include bread & butter, chocolates, dry fruits, packed juices, sometimes even ready to make maggi. It’s important to have these as you need more calories on the mystic mountains to sustain moreover everywhere you will not find decent & reasonably priced hotels or food joints. Hunger can strike anywhere!!! Important accessories: The temperature in the Himachal goes haywire unpredictably. And if you are out on the road in the open, you got to take all the precautions possible. Carrying an umbrella, raincoat and spare pair of shoes is a good idea. 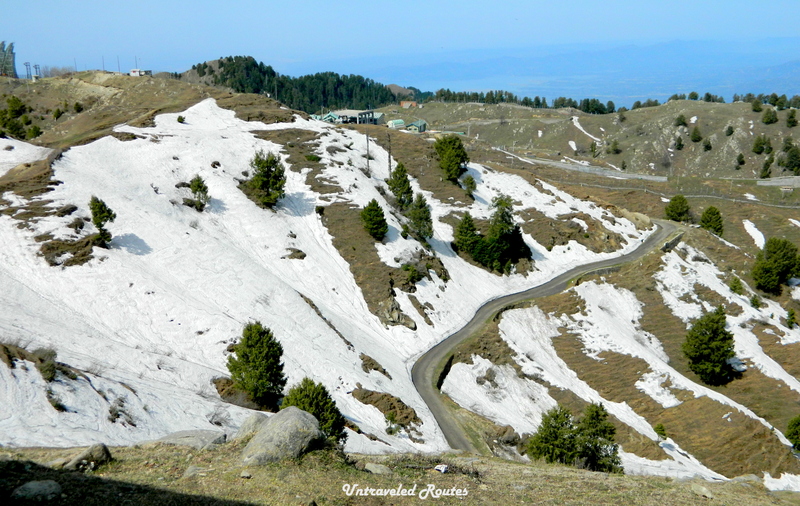 We had this trip in April’14, the skies were clear for most of our journey till Nainikhad, as we were approaching Dalhousie the blue skies started turning dark and the breeze became chilly. Just when we were 10 Kms away it began raining, next thing we know it’s literally snowing!!! Besides the usual items we carried huge polythene cover & rope to save our backpack from the rains. Taking Breaks is a good idea: The route has bountiful scenic beauty and it’s an absolute treat for eyes and soul. So you might prefer to stop at few random places to stretch and click a few shots to rejuvenate yourself. It’s well said ‘the journey matters in the end not the destination’. Mingling with the locals: You will agree that every place oozes a different culture, food, beverages and people. It’s purely insightful to interact with the people & embrace their culture. We have observed that local people in such remote areas are remarkably warm and friendly. Saying Halo!!! to the local kids on the way to Dalhousie, Himachal Pradesh. All images are copyright of Untraveled Routes, please do not copy or reproduce without permission. The breathtaking multi views of Dhauladhar mountain range make the trip all the more memorable.